Evergreen Terrace is a modern and affordable Class C CBRF, licensed by the State Division of Health and Family Services. 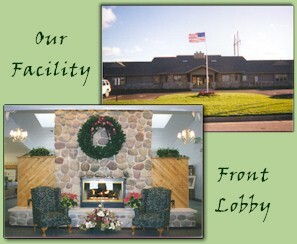 We are a locally owned and operated facility including a Nursing Home Administrator with over 20 years experience in long term care, a Registered Nurse to supervise individualized health care needs, and an experienced manager to direct daily operations. We understand the physical and emotional challenges of aging. We don't believe you need to give up your privacy and freedom just because you need a little assistance. You deserve a place of your own where YOU make the choices - just as you have in your home. There IS a place that offers the support you need and the independence you want - it's a place we call Evergreen Terrace. 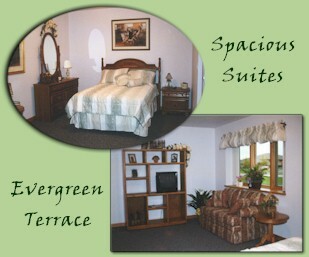 Our Suites, at 364 square feet, are typical of the spacious design of Evergreen Terrace. The living area provides room to relax or entertain family and friends; separate sleeping and personal care areas give you the privacy you need. you are encouraged to furnish your suite with your own familiar furnishings and photos - just as you have at home. 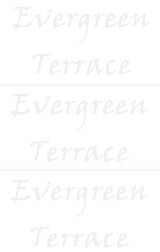 Copyrighted 2000© Evergreen Terrace, L.L.C.